Silicon Valley has the highest average pay in the United States – $2,069 a week, according to federal wage data. That might not be too surprising, but here’s what is: Even after factoring in the region’s notoriously high cost of living, the high-tech hub’s wages come out on top in terms of relative purchasing power. As we’ve noted before, prices for everything from housing to groceries vary widely from place to place, with the result being that a given income can mean very different things in New York, New Orleans, or New Bern, North Carolina. To get a handle on those variations, one can use the “regional price parities,” or RPPs, developed by the federal Bureau of Economic Analysis. The RPPs measure local price levels in each of the nation’s 381 metropolitan statistical areas, as well as the nonmetropolitan portions of states, relative to the overall national price level. Following up on our recent post about growth in average weekly wages, we decided to see how wages in the nation’s 381 metro areas stack up against each other when adjusted for regional price variations. We used the most recent available data for wages (the third quarter of 2015) and the latest set of RPPs (from 2013). Even though California’s San Jose-Sunnyvale-Santa Clara metro area, which covers Silicon Valley, has the third-highest cost of living in the country (after Honolulu and New York-Newark-Jersey City), its adjusted wage ($1,706) is still more than $400 higher than the runner-up, the California-Lexington Park, Maryland, metro area. But in the Santa Cruz metro area, just west of Silicon Valley and with a similarly high cost of living, the average weekly wage is just $888. That means metro Santa Cruz has one of the lowest adjusted average weekly wages in the country: $737, or 357th out of 381 metro areas. Similar patterns exist in several other California metro areas, including Santa Rosa, Napa, Oxnard-Thousand Oaks-Ventura and Salinas. High regional price levels can erode the real value of wages, but relatively low prices can effectively offset low wages, at least to some extent. In Beckley, West Virginia, for instance, the average weekly wage is among the lowest in the nation ($707), but the metro area also has the lowest cost of living; as a result, the adjusted average weekly wage is 28% above the actual wage. The biggest negative differential is in Honolulu, which has the highest regional price level of any metro area in the country and an average weekly wage ($932) that’s somewhat lower than the national average. When adjusted for the local cost of living, Honolulu’s average wage shrinks by more than 18%, to $761. 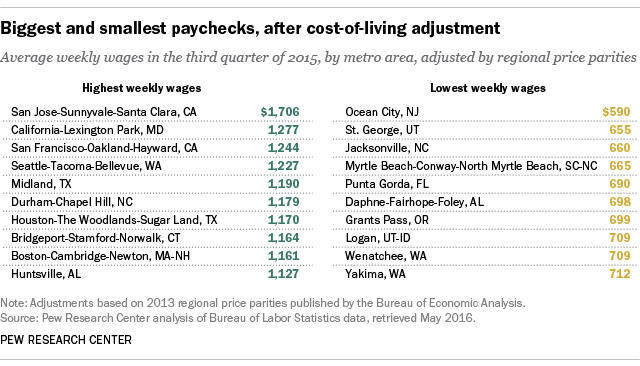 The smallest adjusted wage is found in Ocean City, New Jersey, which has both one of the lowest unadjusted average wages ($640 a week) and a cost of living that’s 8.4% above the national average. Together, that makes the area’s adjusted average weekly wage just $590. As in the previous post, the data used here come from the Quarterly Census of Employment and Wages, a Bureau of Labor Statistics program that gathers data from unemployment-insurance tax forms filed by more than 9 million employers. (Average weekly wages are calculated by dividing quarterly total wages by average total employment for the quarter, then dividing the result by 13.) The data cover all workers who fall under state and federal unemployment-insurance programs, or more than 96% of all civilian wage and salary employment; self-employed workers, most railroad workers, most agricultural workers on small farms, and a few other categories of workers are excluded.